Home Keep CBI Out of Politics-But Only If It Suits Me! Even before the country’s top investigating agency, the CBI could start recovering from the ‘CBI vs CBI’ episode involving its top two functionaries -in fact the new Director Rishi Kumar Shukla was yet to assume charge - the agency got engulfed in another politically motivated storm, this time in Kolkata. The high voltage drama in Kolkata started in the evening of Sunday Feb. 3, 2019 when a strong 40 odd member CBI team descended on the city, ostensibly to question the Commissioner of Police (CoP) Rajiv Kumar in connection with the 4-and-a-half-year-old, Supreme Court mandated investigation into the Sharda and other Chit Fund Scams. There was also allegation of tampering with and possible destruction of evidence in the course of the investigation carried out by the State police team under the charge of Rajiv Kumar. What followed in Kolkata that evening and over the following two days has been widely reported in the national print and electronic media. The blow by blow account, duly spiced by high pitch politically motivated statements, crowd mobilisation, CM Mamata Banerjee (MB) sitting on a ‘dharna’, CoP Rajiv Kumar also joining the protest in a highly unusual and debatable move, carried all the elements and more, of a Bollywood thriller. CM MB cried foul against alleged use of CBI to silence political opponents. Other opposition leaders from Rahul Gandhi to Andhra Chief Minister Chandrababu Naidu, DMK leader Stalin, RJD’s young firebrand Tejashwi Yadav, all joined the chorus painting the CBI as the villain for basically trying to discharge its official duties! The CBI, on the other hand played by the book claiming that the CoP Rajeev Kumar had been avoiding to comply with repeated summons to appear before the CBI investigating team, leaving it with no option but to approach him directly. The CBI also felt that the state administration led by the Chief Minister herself was trying to obstruct the process of investigation which was being carried out under instructions of the Hon’ble Supreme Court. Television visuals of the drama being played out in Kolkata even suggested that the CBI team was physically restrained, perhaps not detained. Physical confrontation between the CBI personnel and the state police was however, prevented by the CRPF contingent requisitioned to secure the CBI local office. As the political ‘dharna’ continued in Kolkata, legal action commenced in New Delhi with the CBI approaching the Supreme Court for issuing directions to the state police, particularly the CoP to cooperate in the investigation. Additionally, CBI asked the Supreme Court to initiate action for contempt of court against the concerned authorities for failing to act in accordance with its earlier directive. Opposition parties countered the move through a battery of high-profile lawyers. The petitions were eventually heard on February 5, by a five-member bench of the Supreme Court headed by the Chief Justice himself. After hearing the arguments of both the sides, in a brief order, the Court decided to ask the CoP to present himself before the CBI team for questioning and cooperate in the investigation process. Keeping in view the charged atmosphere obtaining in Kolkata, the Court further directed that the proceedings may be held at a neutral venue, that is, Shillong. In a relief to Rajiv Kumar, the court asked the CBI not to arrest him. In other related developments, the Supreme Court issued notices to the CoP and others concerned to respond by February 18, as to why action for Contempt of Court be not initiated for not facilitating CBI investigation. This matter will be heard on February 20. In addition, the Ministry of Home Affairs, Government of India, which is the cadre controlling authority of the Indian Police Service, taking cognition of Rajiv Kumar’s apparent violation of the code of conduct by participating in a political dharna, asked the State Chief Secretary and Director General of Police to initiate action against the CoP. 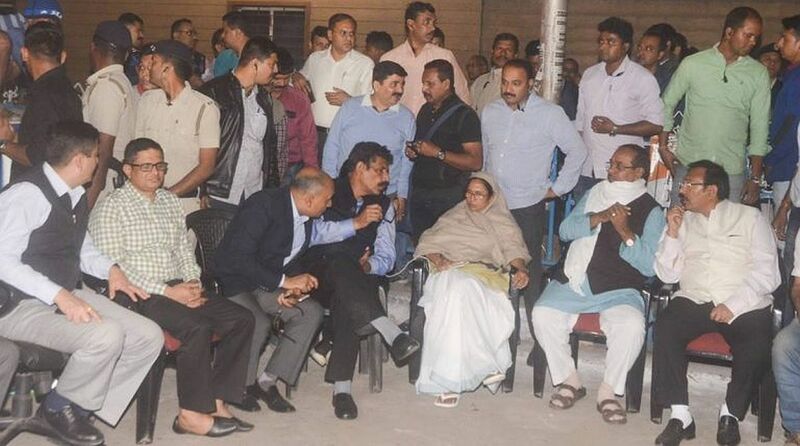 Strangely enough, the Chief Minister herself rose to the CoP’s defence by stating that the officer only come to meet her as part of his duty as the Cabinet meeting was also being held at the venue of the protest. Reactions to the court judgement where on expected lines. CM Mamata Banerjee claimed ‘victory’ of democracy and the Constitution. Other opposition leaders endorsed her interpretation of the judgement. She later called off the dharna but vowed to continue her campaign against the alleged dictatorial ways of the Central Government. Government functionaries in New Delhi led by a group of ministers, mounted scathing attack on the state government and CM Mamata‘s brand of combative politics. A section of the media claimed victory for the CBI. While this drama was being enacted in the main theatre, the sleepy town of Purulia too decided to contribute to the political excitement when the State Government denied permission to let the helicopter carrying UP Chief Minister Yogi Adityanath to land there. He was to address a political rally. The UP Chief Minister flew back to Bokaro in Jharkhand and drive down to Purulia. He addressed the rally though, according to media reports, no permission was obtained by the local organisers to hold a rally there. If true, this too could lead to counter action by the state police and heightening of political tension. The directives of the Supreme Court have brought in a state of truce, though it may be only temporary. It’s not likely to last long for various reasons. First, what would happen if during the questioning and investigation, the CBI team comes to a conclusion that Rajiv Kumar and his team of investigators had indeed tampered with or destroyed evidence? Will they have to go back to the Supreme Court to obtain an arrest warrant or can they proceed to do the needful under the provisions of the Cr.PC? What would happen if the CBI team considers it important to go back to Kolkata or any other place in the state to collect follow up evidence? Will they be required to keep moving to and fro at every stage of the investigation? The fundamental question is whether Supreme Court mandated investigations can proceed only under these restrictions and constraints and would this not amount to curtailing the statutory right and responsibilities in an unhindered manner? A larger question arising out of the decision of the honourable court is whether, in future, investigating agencies will have to move out to different places to question/interrogate witnesses and accused just because the host state finds it inconvenient to let the processes move in accordance with the law? The purist will also ask the question whether the court are required to give weightage to political considerations in such cases where none was essentially required? The truce between CBI and CM Mamata Banerjee will also be temporary because from here on, as the election season starts gaining momentum and political temperature starts climbing up, many actions of the Central Government will be viewed as politically sensitive and the contending parties will keep rushing to the highest court for suspending action or deferring investigation. To say the least, the evolving scenario does not inspire confidence for normal functioning of the state institutions in the coming few months leading up to the elections. There is need for the political parties to exercise restraint and exhibit greater degree of maturity in dealing with the situations of the type witnessed in Kolkata. In fact, if democracy has to take stronger and deeper roots in this country, restraint and maturity should also be the watchword for all of us including the print, electronic, social media, political commentators and opinion makers.